After recently posting that I would not be doing any more races until June, I somehow managed to rework my schedule to fit in this race. 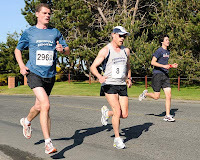 The Oak Bay 1/2 is a fantastic course that starts and begins in Oak Bay, and does and out and back loop along Beach Drive in the Uplands. I was sad a few weeks earlier when I thought I would not be able to fit this run in, especially since it is hosted by my sponsor Peninsula Runners, however things sometime work out for a reason. I was feeling pretty good with my running the week leading up to the event, but hurt my back the day before the race quite drastically. I was out in Sooke helping my family build a rock wall, and I felt my back twinge when I picked up the very first 66 pound bag of concrete. My back that night was sore and I actually could not really bend over to touch my toes. It hurt to sit up and sit down. At this point, I could only hope that my back would somehow be 100% by the next morning. The night would be a good one, and I think I actually got 7 hours sleep (this is more than the norm!). However, upon waking up, my back was in no better shape than the night before. I tried to stretch things out, but all I could do was to take a couple Ibuprofen and hope that that would fix things. I headed to the race in ample time and was blown away to see the setup for the event. There was an awesome start/finish line setup and there were many big runners at the race (the prize money seems to get them out). I took a light warm-up and quickly realised after about 3 steps that things were going to be really difficult. My back gave me painful jabs with every compression on the road. I was now thinking of maybe not even starting the race. However, as the warm-up progressed I felt slightly better and decided to start the race and just see how things would play out. The race began with the usual fanfare and I was content to be in the secondary pack behind the leaders. 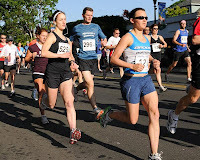 The back pain immediately dissipated and I was, all of a sudden, in this race. The first k went by in 3:30 and I was in a group of familiar faces. Catrin Jones was once again in this race and I knew that she was a consistent 1:24 runner, so I made it my goal to hang onto her. The next couple of k's would go by nicely, and I was actually feeling great. I almost couldn't believe my luck that I was pulling this thing off. I caught up to race director Dave Milne and chugged alongside him for a k until her said to me, "You are not going to believe this Jeff, but I've gotta stop and take a piss!" I was actually feeling the same thing and was hoping to make it to a regulation bathroom stop, but I thought it would be just as easy to stop and provide some garden hydration to some lucky Oak Bay resident. Dave said, "Here!" and he ducked off into a cedar hedge. I followed his lead and found a nice corner just a few metres ahead. After a good 45 second stop, my bladder was now ready for the next 17k. I quickly found a zone soon thereafter. I held onto a solid pace and it felt like a comfortable one. I was still on a sub 4 min/km pace, so this was setting me up very well if that pace could ever be held. At the 10k marker, I was at 39:02. I was now right behind PIH member and master runner, Nancy Baxendale. She was a solid runner and I had always dreamed of one day beating her. The good fortune continued and I was able to pass Nancy at the 12k marker. Catrin Jones was still ahead of me by about 30 seconds, and I thought I had a pretty good chance of catching her as well. My pace was consistent and I was in good standing as I came up to the big hill at the 15k mark. The hill up to the golf course yielded nothing however, as I made no ground on Catrin and lost nothing to anyone else. I was now really on the final stretch and with the final 4k being flat, I was just hoping to not lose ground. I had started on an ambitious pace, and held it so far, and it appeared as if I was right on a new record time. Kilometre 10 and 20 would come and go with not much problem and I felt alright. I was wishing at this point I had a bit more energy to hammer out the final kilometre, but there was not too much more high-octane gas in the tank. I did make the final hill though without too much difficulty and began to pick up my legs for the final chute finish. The final clocking was 1:24:52. This was an unbelievable time considering I almost didn't start the race. In a perfect combination of the adrenaline and the Ibuprofen kicking in at the right time, my back pain seemed to not matter for the race. The time would be 1 second off my PR. I finished 18th overall out of 621 runners. I finished 3rd in my age group. 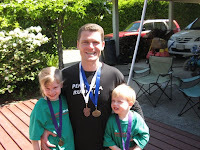 Shortly after the race, I would meet my family and do the Kids Crazy Kilometre with Teagan and Griffin. The event was perfect, and it was simply an awesome morning for me. As I write this, the day after, my back hurts again. I think I need to see someone to see if it is muscular, SI joint alignment, or disc issues. With any luck, I will be good to go again in a day or two...I've gotta be good for my next race in 2 weeks. Update: So I went to the chiropractor and my back was severely out of whack. Things are feeling much better now after a serious adjustment. The pain has subsided tremendously. Thank you chiro Cindy Berna! 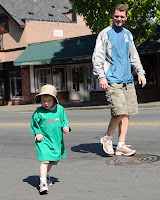 Some pictures from your oak bay half-marathon run.